I knew what he meant. It’s not like I’m chanting, “Drill, baby, drill,” each time I fill up my tank, but I’ve always thought of Los Angeles as an oil town, too. Though the city’s mythology is built around orange groves and movie sets, the oil fields here helped fuel the region’s boom and have produced more than 9 billion barrels during the past 125 years. The county pumps out 12 percent of California’s oil, with nearly 80,000 people working directly or indirectly in the industry, while Chevron’s El Segundo Refinery, the state’s largest, processes 269,000 barrels (42 gallons in each) daily. California’s commercial oil industry was set in motion in the 1870s with the finds at Pico Canyon near Santa Clarita. In 1892, Edward L. Doheny used a sharpened 60-foot eucalyptus log to drill L.A.’s first major well in what is today Echo Park. Just three years later the Los Angeles City Oil Field, which stretches between Vermont Avenue and Dodger Stadium, was pumping out more than half of the state’s total. Over the next few decades Los Angeles became the Saudi Arabia of the time—the world’s most productive oil region. Dense forests of derricks popped up around the nascent downtown and along the beach at Venice and near Long Beach on Signal Hill, which earned the nickname Porcupine Hill. The pump jacks that remain aren’t the only vestiges. Click on the state Division of Oil, Gas & Geo-thermal Resources well-finder map, which shows both active and inactive sites, and L.A. becomes blotched with black. The map reveals plugged and buried wells a half block from my former apartment, west of the La Brea Tar Pits on Orange Street, and more than 40 others a few blocks away. They were part of the South Salt Lake Oil Field, one of 11 major fields between downtown and the Westside (there are 68 in the Los Angeles basin). I’ve lived near an active site, too: the operation that borders the fourth, fifth, and sixth fairways at Rancho Park Golf Course. It’s one of the nearly 6,000 active oil and gas wells in the county, according to a Natural Resources Defense Council report that estimates 600,000 residents live within a quarter mile of such locations. But as with so much else in the region, your zip code has a lot to do with how much your life might be affected by drilling. We’ve all seen the Beverly Hills High derrick camouflaged in floral cladding. It actually sits over 15 wellheads. A windowless beige office building on Pico near Genesee conceals 52 wells that reach like tentacles under the surrounding neighborhood. The landscape design firm of Linesch & Reynolds, which worked on Disneyland, created the tropical world of palm trees and waterfalls that camouflage more than 1,000 wells on the four drilling islands off Long Beach. Ten minutes up the coast from there in Wilmington, which sits on the third-largest oil field outside Alaska, camouflage is a lost cause. Drilling activity occurs an average of 260 to 315 feet closer to homes, schools, and parks than on the Westside. The same is true in South L.A., where residents of the University Park neighborhood have been doing battle with AllenCo Energy, which has a drilling operation on property leased from the Archdiocese of Los Angeles (and bequeathed by Doheny’s heirs). In 2010, AllenCo engaged in acidizing, a cousin of hydraulic fracturing (aka fracking) that relies on acids to dissolve rock and free up oil deposits. Output jumped by 400 percent, but residents soon began to complain of foul odors and an array of health problems. The best they could do was keep their windows closed. “It seems like a basic human right to be able to open your windows and breathe clean air,” says Sandy Navarro. She’s program coordinator with People Not Pozos, an environmental justice campaign that grew out of the nonprofit Esperanza Community Housing Corporation. “People would get so hot and they were trapped in their homes. Some of them thought they would have to move, but they couldn’t afford anything else.” Growing up in the neighborhood, Navarro didn’t know about the drilling. Trees and a high wall set back from the sidewalk along a shaded grassy strip effectively hid the facility’s network of pipes and tanks from passersby at 23rd Street and St. James Place. We walk over to Estrella Park, hard against a slope along a 110 freeway on-ramp. Kids play on a patch of lawn, watched by their babysitters. One of those sitters is Margarita, a 25-year local who began to suffer headaches and stomach pain when AllenCo stepped up production. Her teenage daughter developed asthma, while Margarita’s son-in-law woke with nosebleeds that soaked his pillow. Some neighbors say they lost their sense of smell. The city attorney sued AllenCo , deeming it a public nuisance, and the South Coast Air Quality Management District cited it for 18 violations before the company suspended drilling in 2013. Symptoms quickly disappeared. In 2016, AllenCo agreed to pay $1.25 million in civil penalties. Before it can resume drilling, the company must allow inspections by government agencies to prove it’s in compliance with all federal and local regulations. It was also ordered to install a system to monitor contaminants, including methane and hydrogen sulfide, which will be overseen by a city-appointed expert. Moreover, in 2016, the city finally named its first full-time petroleum administrator since the 1980s to oversee compliance and lease issues. But proving definitive links to much of anything having to do with oil extraction can be an elusive goal. It certainly has been for residents in Baldwin Hills, home to the oil field my friend was admiring. Understandably, for the 50,000 or so predominantly African American households adjacent to it, there’s nothing noirishly romantic about the place. Though the county established the Baldwin Hills Community Standards District to address the local impact related to oil and gas production, residents continued to complain not just of noxious odors but also of deep cracks across patios and in the walls of their homes, which many say are caused by vibrations from site operations. Some have blamed fracking. 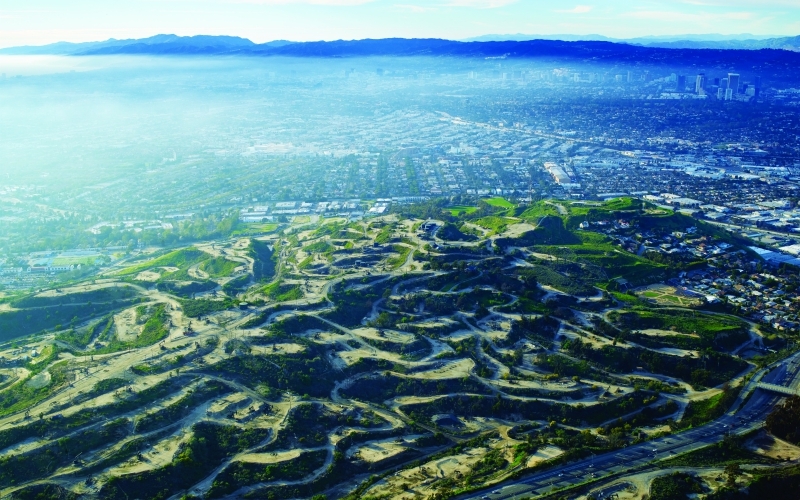 A small section of Baldwin Hills isn’t part of L.A. It’s unincorporated and is represented by County Supervisor Mark Ridley-Thomas, who maintains that only two wells have been fracked in recent years (in 2011 and 2012), both for research purposes. In an area that witnessed the 1963 catastrophic collapse of the Baldwin Hills Dam due to ground subsidence from oil pumping, such assurances provide little comfort. 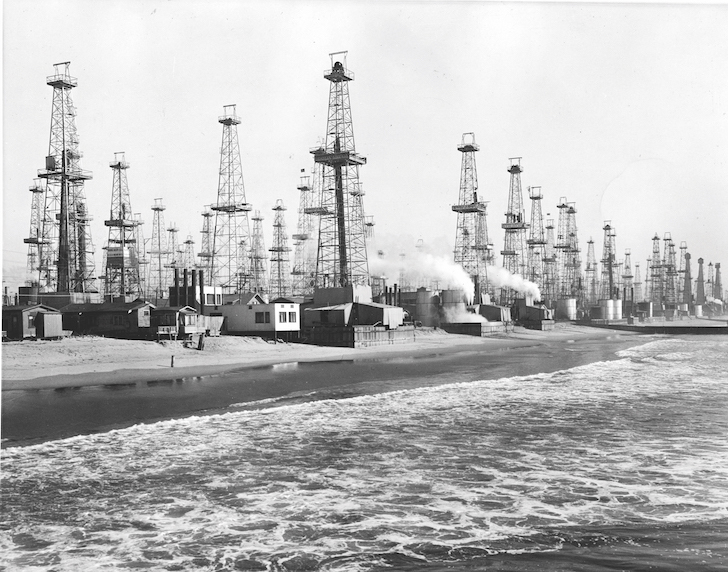 Even less comforting: New research by two U.S. Geological Survey scientists suggests that the 1933 Long Beach earthquake, which killed 120 people, may have been triggered by deep oil drilling. Which is to say that we’re still figuring out the extent of impacts the oil industry has had on the region. Other effects have been more obvious, like when pipelines in Atwater Village ruptured in 2014, flooding the area with crude. Or when the ExxonMobil refinery in Torrance blew in 2015. The explosion was equivalent to a magnitude 1.7 earthquake, showering the area with toxic ash and sending large pieces of debris flying; one narrowly missed a tank containing tens of thousands of pounds of modified hydrofluoric acid. A U.S. Chemical Safety Board investigation concluded that, had the debris ruptured the tank, the breach could have resulted in “a potentially catastrophic release” of the acid into the community. Most of us experienced the accident as little more than a surge in gas prices while the hobbled refinery operated at less than 20 percent capacity during repairs. Then a few months after ExxonMobil finalized its $537.5 million sale of the facility to PBF Energy in 2016, Torrance officials ordered locals to shelter in place as flames and smoke poured from stacks when a power outage forced the refinery to burn off excess toxic gases to prevent a direct release into the atmosphere. For residents, the region’s oil town status is a fact of life, one that’s not likely to change anytime soon. 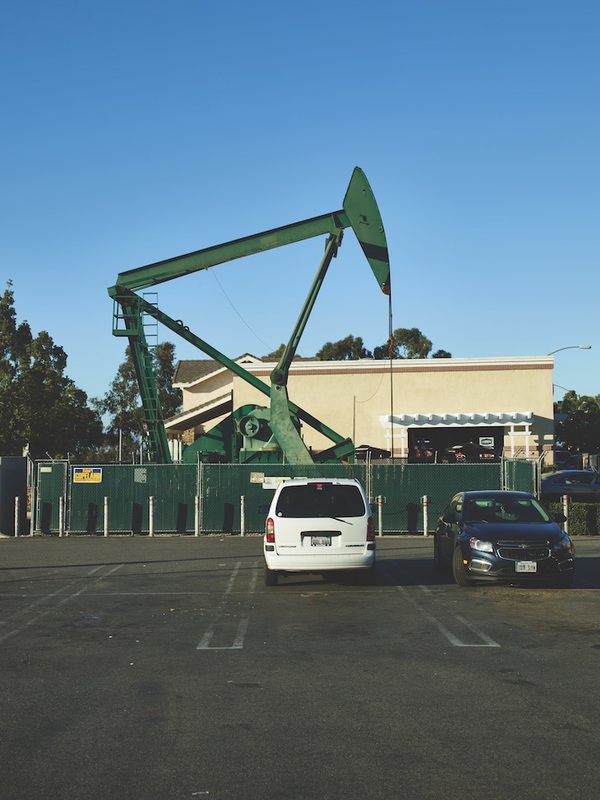 In 2013, the Geological Survey estimated that between 1.4 billion and 5.6 billion barrels of recoverable oil remain in the Los Angeles basin’s ten largest fields alone. In fact, it described the area’s geology as “a nearly ideal petroleum system…[with] one of the highest concentrations of crude oil in the world.” Such findings dovetail with the Trump administration’s vow to aggressively exploit domestic oil supplies and decrease environmental regulation. Combine that drive with the state’s own push toward curbing greenhouse gases and you have something any petronaut could appreciate: a combustible mix. CORRECTION: This article has been updated to reflect that fracking is not, in fact, banned in Los Angeles. 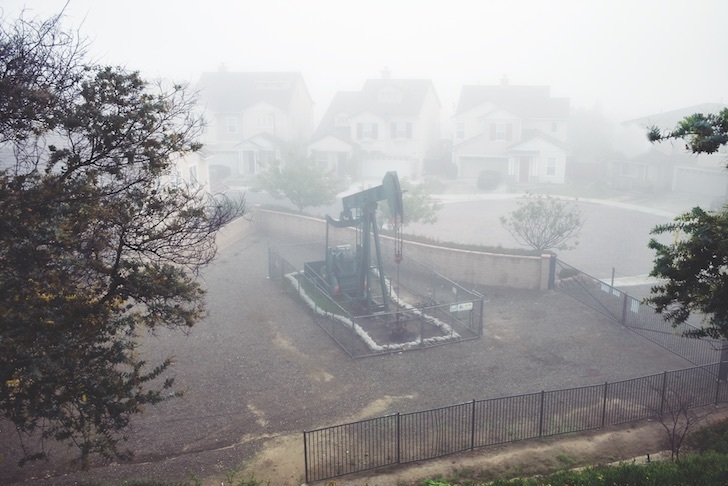 Next article4 Oil Wells Hidden in Plain Sight in L.A.